This Monday at 9pm many of Miami’s dessert lovers (including me!) will be tuned into the premiere of Food Network’s Best Baker in America. The second season of the competition style show features one of our favorite pastry chefs in town — Max Santiago (formerly of The Sugar Factory and original co-founder of The Salty Donut). Best Baker in America features nine bakers competing for the title. Along with our very own Max Santiago is Becca Craig (Philadelphia, Pa. – Executive Cake Chef), Kym DeLost (Chicago, Ill. – Pastry Chef), Jeremy Fogg (New Orleans, La. – Pastry Chef), Frania Mendivil (Los Angeles, Ca. - Executive Pastry Chef), Leigh Omilinsky (Chicago, Ill. - Pastry Chef), Lasheeda Perry (Atlanta, Ga. – Executive Pastry Chef), Jean-Francois Suteau (White Sulphur Springs, W. Va. – Executive Pastry Chef), and Adam Young (Mystic, Conn. – Bakery Owner and Head Pastry Chef). During the course of the season the nine bakers will have to prove to the judges that they have what it takes to be the best, by making their way through culinary challenges designed to test their baking expertise and their inventiveness, including baking perfect Petit Fours to creating a classical French layered meringue cake to constructing the perfect strawberry shortcake and old school classics such as a Charlotte Royale and a Mont Blanc cake, all leading up to the finale on Monday, June 18th when we find out who truly is the Best Baker in America. 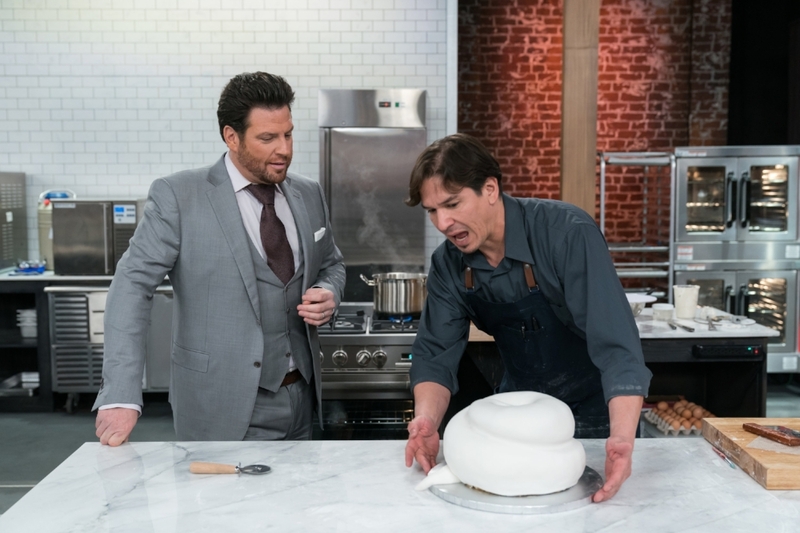 The show is hosted by Scott Conant (we’re big fans) and judges include Jason Smith and Marcela Valladolid along with a guest judge that rotates each week including baking digital influencers Yolanda Gampp, Joshua John Russell and Gemma Stafford, and prominent cake and pastry experts Florian Bellanger, Shinmin Li, Sherry Yard and Zac Young. I did some chatting with Yolanda Gampp (of How To Cake It) last weekend at SoFlo Cake and Candy Expo and she says she had an awesome time during her guest judging on the show. “I thought it was a great experience and I got to eat some delicious cakes. Everyone was so talented and really brought their A-game,” says the YouTube superstar. Amber: As a longtime fan, I know this wasn’t your first time on TV… Did you approach it differently than last time? Max: Oh my god! Yes absolutely! I hate doing TV stuff like that, because when I first did it several years ago I just kind of went into it, and you know, as a chef you think you’re prepared for this kind of thing. It’s what I do and I have confidence in my pastry skills. But when you’re on the spot and in a new kitchen, on the clock — the pressure it on and it's a totally different ball game. I quickly learned that it takes a completely different kind of chef to handle competition. To be honest, I did horrible the first time! You go in and try to do something super fancy because that’s what you’re used to and the time makes it so hard. So it’s kind of a shock that someone with less experience can come in and make something simple and really wow the judges. I have major stage fright, so when I did the show I went into it because I wanted to overcome that fear. I actually love being on camera, just not competing. It’s a mental block about being on camera and focused while the clock is ticking. The biggest thing I learned is no matter how much experience you think you have — you still need to practice. Amber: I can only imagine. So with that being said, how has your style changed being on TV? Everyone knows you love your gorgeous plated desserts! Max: All I can say right now is I bring a lot of Latin flair with me, you’ll see a lot of my culture bring influence on the flavors I use. I’m very proud of being from Miami and I make sure everyone knows that. Amber: Can you walk us through how the show works? Admittedly, I never had time to watch last season. Max: It’s Top Chef style. There’s always two challenges every episode, then there’s a winner from each. The first is a Skills Challenge — it’s much shorter in time (not always easier), then there’s a Master Challenge. There’s a winner for each and someone goes home in every episode. The pressure is really on. Amber: What was it like to work with Scott and the judges? Max: Scott was the comedy relief we needed every day and made things more easy going. He really made it something to look forward to and was always cracking jokes. We have a lot of the same characteristics and are both a little arrogant and well aware of it, so it was fun to have that energy around. Marcela is a natural on TV and was always so sweet. Jason is really nice and fun to work with. He’s got a great personality. But when it comes time to get the show going, both are really intense about the way that they judge and took the theme of each episode really seriously. Amber: What made you want to be on Best Baker in America? Max: Getting rid of the stage fright was the main reason, but I also wanted to create more exposure of my donut shop opening in Spring of 2019. It’s going to be an all day breakfast bar with a variety of donuts. There’s going to be an open kitchen where you can see the donut decorating. I’ll have hot and fresh donuts every 30 minutes. The menu will feature 8 to 10 chef driven breakfast items, like an open faced eggs benedict on a donut, or avocado toast on a donut, and one of my favorites — an everything donut with cream cheese spread and salmon. I also got a taste of some amazing vegan donuts while filming in California, and I’ve been practicing. I’m bringing the best vegan donut Miami has ever seen and it's a raised a donut so it’s going to be amazing! I’ve also got a totally new brioche recipe lighter and more moist and a brand new cake donut recipe. Tune in this Monday at 9pm on Food Network to cheer on Miami’s Max Santiago as he competes for Best Baker in America!